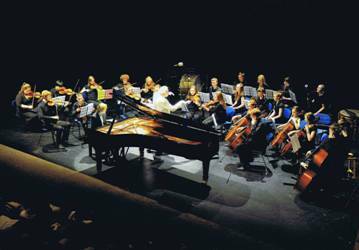 The Jersey Youth Chamber Orchestra (JYCO) is a new joint project shared between the academy and the Jersey Instrumental Music Service, and sponsored by the Strasser Trust. Open to local under-18 string players of Grade 5 level and above, and young wind, brass and percussion players of Grade 6 level and above, the orchestra met for the first time under the baton of conductor Robert Roscoe from Chetham’s School of Music (one of the UK’s leading specialist music schools). The orchestra’s inaugural performance featured soloist Krystian Lamb, performing Mozart’s Piano Concerto no.15 in B flat, and then the complete set of movements from Gounod’s Ballet Music from Faust. The two works required completely different styles of playing, and plenty of technically challenging musical material for each player. But everyone’s dedicated hard work and practice helped to deliver an exhilarating performance on the evening, in front of a large audience at the Jersey Arts Centre. 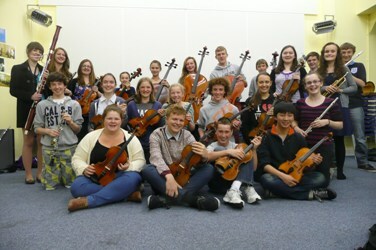 This was a very exciting start for this new long-term project, and the orchestra will meet again to rehearse towards a concert on November 25th at St. James, and on this occasion the orchestra will feature local young violinist Elliot Samphier performing Mozarts’ Violin Concerto in G, and the orchestra will be conducted by Stephen Threlfall, Director of Music at Chetham’s School of Music. Our sincere thanks go to the Strasser Trust for their sponsorship of this project.